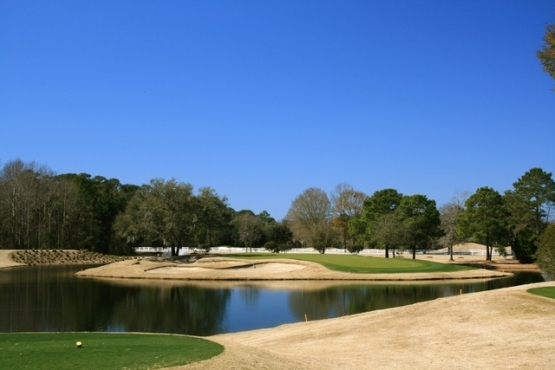 The Tradition Club in Pawleys Island is typical of Myrtle Beach golf courses located there. It is set upon an old rice plantation that dates back centuries. Southern traditions and Lowcountry golf at its best is what you will find when playing the Tradition Golf Club. Tradition Club has wide generous fairways that are surrounded by natural marshlands and are bordered by gorgeous trees of the Lowcountry. Water and sand are in abundance as you navigate through the marshes that lead to well-guarded greens. Water comes into play on ten holes and the course also has two island greens. The Tradition Club was once named the South Carolina Golf Course of the Year and it continues to be honored with various awards from leading golf publications. While playing the Tradition Club be sure to take advantage of many of the Myrtle Beach golf photo opportunities that are available. The Mega Practice Complex at the Tradition Club is a wonderful practice facility and might be the perfect place to reward yourself with a Myrtle Beach golf lesson. If you are looking for the best in Myrtle Beach golf deals, you will not be disappointed by choosing a Myrtle Beach Golf Authority golf package. The outstanding choices of the finest Myrtle Beach golf courses combined with the best in Myrtle Beach and North Myrtle Beach accommodations are second to none. The Grand Strand has so much to offer with the world class Myrtle Beach entertainment, white sandy beaches, mild Myrtle Beach weather and Southern hospitality. It is all just waiting for you to book your Myrtle Beach golf package!